Oh, the things we could say about our optical 3D measuring system CamBar B1. Some call it the little brother of CamBar B2, but we beg to differ: CamBar B1 is unique in its smooth combination of small size and sharp precision. 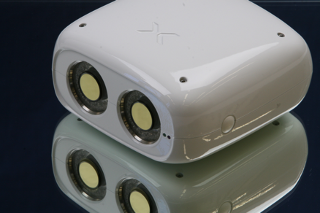 There is no comparable stereo tracking system available on the market. Less than 20cm in width, the optical 3D measurement system reaches a measurement accuracy of 1/100 mm, making it the perfect tracking system for short measuring distances in small volumes. CamBar B1 allows highly accurate 3D positioning as well as tracking (navigation) of tools and other objects. The stereo measuring system finds application in neurosurgical and dental navigation, navigation in ENT surgery, industrial quality assurance and positioning. Groups of AXIOS 3D® 3D tracking systems can be operated in networks via a network interface, allowing the optimization of measurement accuracy and measurement volume. CamBar B1 likes to share what it sees. The measuring system allows access to its cameras’ image data, creating the option to directly monitor tracking via a live image: a plus for everyone involved in troubleshooting and quality control.